Lexus LF-CC concept car revealed | What Car? This is the Lexus LF-CC, a concept car that's made its public debut at the 2012 Paris motor show. 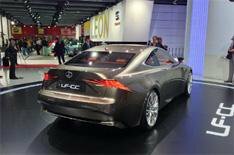 Lexus says the LF-CC's styling will influence the looks of its future compact executive models. That means it gives a strong hint at how the next Lexus IS saloon will look when it arrives next year. Lexus has also confirmed that the LF-CC previews a new coupe version of the IS. A drop-top derivative of this would be a replacement for the current IS Convertible. A new hybrid powertrain, which combines a four-cylinder 2.5-litre petrol engine with an electric motor, makes its debut in the LF-CC. In the new IS it will replace the current 2.2-litre diesel, meaning that Lexus will offer petrol or petrol-hybrid versions only. A version of the new hybrid system will become available in the GS executive saloon in summer 2013. As well as sharing styling cues with the GS, the LF-CC also shows the influence of Lexus' LF-LC concept car, which was unveiled at the 2012 Detroit motor show. The LF-CC's LED headlamps and small door handles and mirrors will be limited to the concept car stage, but the deep 'spindle' front grille and overall shape aren't expected to change significantly for the production version of the new IS coupe. Lexus insiders have hinted that the some of the LF-CC's design features, such as headlights and rear lights that 'cut into' the bumpers will be retained.